Remember my new goals? Balance, Organization and Discipline. I must admit that breathing through both nostrils has been my goal for the last couple weeks. My need for oxygen trumped all that other hoo haw. I think I'm ready to get back on track. I know I'm feeling better. 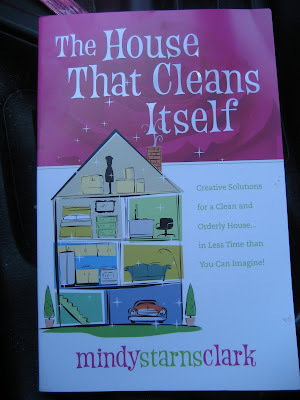 Today, as my breathing improves, that inspirational book, The House that Cleans Itself arrived in the mail. Did you know that the author has a blog with hints? Go here to check it out. I was pulling out of the drive when I checked the mail and saw the package. And then, I saw my gates. Oh, dear. 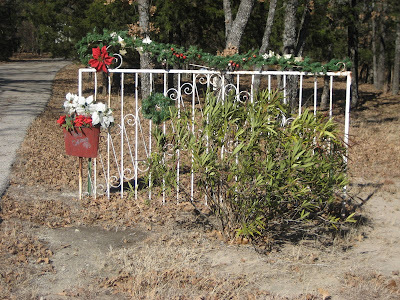 Poinsettias, wreaths, garland and berries. I need to get after that, don't I? 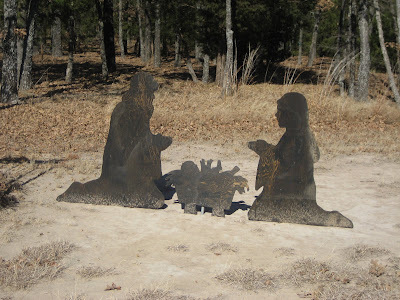 And the nativity too, of course. My computer is funky today. Pictures are aligning right. Text is weird. Huh. A large thanks to all of you who sent kind words/thoughts and prayers to Jan and Tracy (from my last post). And Mom and I enjoyed a wonderful lunch with Theresa yesterday. Thanks for the good company, my friend. For the record, my mojo is so off with this weird alignment/text issue. Kathie and I are considering going to Round Top/Warrenton for the spring show. We'll stay 2, 3 or 4 days. Any suggestions/recommendations for good, economical lodging? We looked at the Willow Nest, but some lucky folks have already booked it when we'd like to go. We wouldn't mind pitching a tent, but Kathie just said no to public showers. She's such a girly girl! Bring on the suggestions or offers to stay with you free. We're not proud. It may not be your computer. I couldn't get my signature to go to the bottom of my blog today. It kept aligning to the right of the pictures no matter how many page breaks I put between the last picture and my signature. Weird. Finally I just gave up and went without signature. I like your nativity sillowetti (thats how FringeMan and I say it). I'm so glad you're feeling better, Mindy! Didn't know you were sick, but glad you are feeling better! We are planning on Warrenton too and are dealing with the same problem...you could stay with us...if we had a place to stay! Why aren't you playing Never-Ending Story today? We miss you! Re member the song "Breathe"? Sorry, I know that doesn't help. Hope you are better. It has been so cold here in TN. We are not used to this much cold without a break. We are ready to breathe too. Nice of you to suggest sending blog notes to the others with problems. I will have to visit them. Can't wait for you guys and the Hollow girls to come down. Please let it be warm! I am going to check out that book RIGHT NOW! Mindy, you know I offered you let you stay with me in the casita, but I totally understand your friends dilemma. It's a real challenge for me too. I do love the shows enough to rough it for the week though!